Especially the Christ figure. If we want our hero to be good, just, kind, and honest, then who better to compare them to than the man himself, Jesus Christ. It seems like you can’t watch a movie without tripping over someone who is supposed to remind us of Jesus. From the obvious, like Neo and Superman, to the more subtle, like Optimus Prime, Harry Potter, and Aragorn. But what makes a figure Christ-like? And why do writers choose to do it so often? “While we may not be all that well versed in types and archetypes from the Bible, we generally recognize, whatever our religious affiliation, some of the features that make Christ who he is. As you can see, it is a fairly comprehensive list, and can be a bit specific, but once you dig into it, it all starts to make sense. Right off the bat, I’ll say that a character does not have to exhibit all of these characteristics to be a christ figure. In fact, they should not. If they did, well then they would just be Jesus instead of just resembling him. And they also don’t have to match up with each of these tendencies exactly. Maybe the character isn’t a carpenter, but they build things. That comparison could be made. Maybe they die, and resurrect before the third day. That still counts. It’s more about the spirit of the comparison than the actual word of it. Came to redeem an unworthy world. While most of these are rather obvious (self-sacrifice, rising from the dead, redeeming an unworthy world), there are a few that we can dig into. When Neo first meets The Oracle, he also meets a group of children that are thought to also possibly be candidates to be “The One.” He immediately gets along with them, and one tries to teach him how to bend a spoon with his mind. “There is no spoon.” He’s good with children. In The Matrix: Revolutions, we get this scene, which speaks for itself. Across from Neo we have Agent Smith. He’s an evil character willing to do anything to keep the world in his idea of order. He lies, he kills, and he assimilates innocent people to attack Neo, corrupting them. He will use any means to stop “Mr. Anderson” and frequently confronts him. He’s the devil. 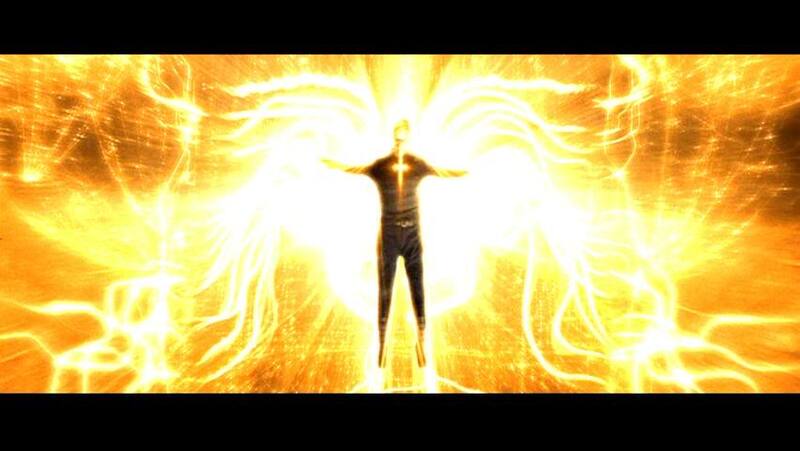 Neo finally defeats him by accepting him into his body, destroying him. He forgives him. Neo’s crew mates on the Nebuchadnezzar are fiercely loyal to him, and are willing to sacrifice their lives for him in order to follow “The One” and save their world. They are his disciples. They are a group of outlaws, labeled terrorists in the Matrix. He keeps the company of thieves. As a bonus, he is even betrayed by a crew member/disciple, who sells Neo out to the agents for a ticket back into the Matrix. What a Judas. It sets up Neo as just, as correct in his actions and provides an easy framework for us to separate good rom evil. It allows us to easily accept the fact that people in the real world so readily accept him as a savior, and when he performs his miracles (stopping bullets, flying, reviving the dead) we are ready to believe it. You can see these same comparison in so many modern stories, if a little less obvious than the rather heavy handed symbolism in The Matrix. We could spend all day listing characters that symbolize Christ and still be nowhere near the end of the list. It is pervasive amongst all types of media, and it is important to recognize it in our critical discourse about story and characters. It gives us an additional level of insight into the story and where they might be pulling influences from and allows us to better understand the complex (or not so complex) themes that underly a plot. 1 This isn’t the first time I’ve mentioned this book, and it definitely won’t be the last. Do yourself a favor and pick up a copy, it’s a great introduction to critical reading. And they are cheap.